Now available in Japanese and Chinese! Hello! 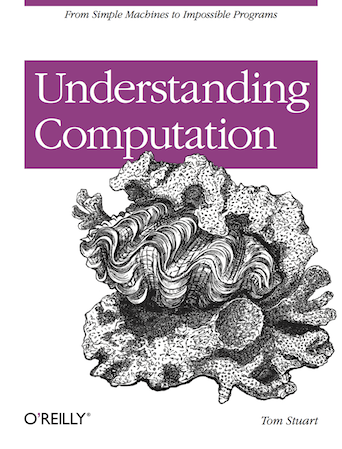 Understanding Computation is (I hope) a fun and interesting book about computation theory, with explanations written in real Ruby code instead of mathematical notation. It contains old, deep ideas from theoretical computer science, deconstructed and explained in an engaging, practical way for an audience of working programmers without assuming any academic background. The focus is on answering questions about computation and the fundamental mechanics of programming languages: how do they really work? what can they really do? what do the programs we write in them really mean? The book’s full of pragmatic explorations of these questions, demonstrated with real code and meaningful examples in a familiar language. These are foundational concepts that you’ll wish you’d always known, digested and presented in a way that makes sense; universal truths which are interesting in their own right, but which also give you a better understanding of the way you do your job and the limitations of what’s possible. build a simple type system. To find out more, please check out the table of contents, download a sample chapter, read what people are saying on Twitter, watch some related videos, download the example code, and get in touch with any questions or comments.